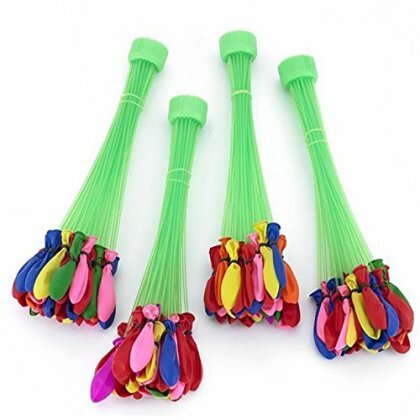 #1 PARI CREATIONS BIODEGRADABLE BUNCH O BALLOONS, GREAT for WATER BALLOON FIGHTS THAT HAVE YOUR KIDS LAUGHING AND ENTERTAINED FOR HOURS IN HOT SUNNY DAYS, INCLUDES A HOW-TO GUIDE. NOSTALGIA; Relive your childhood with these multi-colored water balloons. Let these BUNCH O BALLOONS help you bring back your memories of your childhood. Included is a How-To Guide to make sure you get most for your buck. GREAT FOR ENVIRONMENT; Because we care about nature our water party balloons are BIODEGRADABLE, so you don't have to worry about soil pollution and still have a lot of fun. CREATE MEMORIES; Your KIDS SMILES are priceless when you will see them use these water balloons for their hot sunny day water bomb fights. Help you and your family feel refreshed with these party balloons. EASY TO USE; Forget the hassle of filling one balloon at a time and then trying to seal them, these BUNCH O BALLOON are self sealable once filled to its capacity. Fill 111 BALLOONS in just few seconds. OUTDOOR FUN; Technology has taken over in every household and families are staying more behind ipads, iphones, and laptops instead of spending time together. A great water balloon fight can bring your family outdoors to enjoy the beautiful sunny day together.